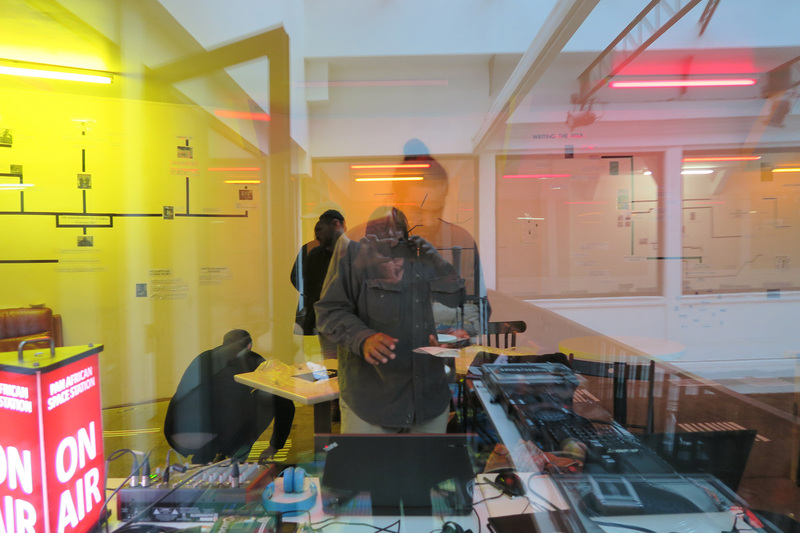 Chimurenga returned to Paris for a 5-day intervention and installation at La Colonie. From December 13 – 17, 2017, we installed a live radio station and a research library, and hosted talks, screenings and performances that asked ‘Who Killed Kabila?’, as the starting point for an in-depth investigation into power, territory and the creative imagination. The equation was simple: the length of a Congolese president’s reign is proportional to his/her willingness to honour the principle that the resources of the Congo belong to others. Mzee Kabila failed. At La Colonie, Chimurenga installed a library that included books, films, and visual material mapping extensive research that investigates history and changing formations of rule and accumulation, space and territory, allegiance, citizenship, and sovereignty, and the African imagination in music and writing. Each day, the Pan Africa Space Station, broadcast live with a programme of interviews, discussions and performances by collaborators from around the world including musicians, DJs, journalists, writers, political theorists, thinkers and filmmakers. After the event, the sounds and images generated in this process will contribute towards a special edition of our Pan African broadsheet, the Chronic. Participants included Dominique Malaquais, Parselelo Kantai, Philou Lozoulou, Yvonne Adhiambo Owuor, Barly Baruti, Victor Gama, Lulendo Mvulu, Déo Namujimbo, Luigi Elongui, Maurice Poto, Mengi Massamba, Hugo Mendez, Jihan El-Tahri, Bintou Simpore, Martin Meissonnier, Paulo Inglês, Franck Biyong, Ray Lema, Brice Ahounou, Nadine Fidji, Spilulu, Arnaud Zaitjman, Julie Peghini, Sinzo Aanza, Koba Lubaki, Percy Zvomuya, Boddhi Satva, Abdourahman Waberi, Antoine Vumilia Muhindo, Sam Tshintu & Academia, Trésor Kibangula, Bullit, Kovo NSondé, Rokia Bamba-Mennessier, Emmanuel Nashi, Franck Leibovici, Julien Seroussi, Daniel Kalinaki, Pascale Obolo, Kivu Ruhorahoza, Jacques Goba, Mo Laudi, Michelange Quay.